Choose recipient ...Hoche Butter GmbHAnja Brand Please choose a recipient. For decades Hoche Butter GmbH has been one of the largest suppliers of butter, butter fat and milk fat specialities on the German market with a special focus on touring butter (plates). 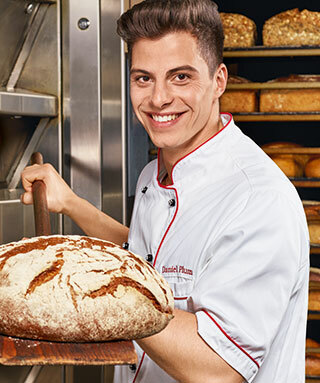 Within the Uelzena eG group of companies, Hoche Butter GmbH sells an extensive range of high-quality butter and butterfat products for bakeries, confectioners, wholesalers and end consumers under the brands Hoche Butter, Butaris and Uelzena. The Hoche Butter brand has long stood for consistently high product quality among bakery and confectionery users. Due to the special product range that has developed over time as a result of the specific requirements of professional processors, Hoche Butter is now regarded as a specialist in the bakery and confectionery trade. A special focus of the product range is the butter plates segment for touring croissant, Danish pastry and puff pastry. Melting point, plasticity and melting behaviour can be precisely adjusted if required using a special fractionation technology. The addition of higher-melting fat fractions, for example, increases the load-bearing capacity of the croissant butter plate during touring even under difficult ambient temperatures. The assortment for the baker is supplemented by German branded butter, bakery butter with vanillin or carotene, sweet cream butter, soft or fine pure butter, butter fat with vanillin or carotene and buttersiedefett. The products are characterised by consistently high product quality and production from predominantly own, regionally and sustainably produced raw materials in Germany. All products are characterised by non-fluctuating product quality and optimum processing properties, which guarantee a continuous processing process throughout the year. We supply brand quality for the bakery. You can obtain our products from the relevant specialist wholesaler or directly from us. Please contact us, we will gladly find the nearest dealer for you.